Mrs. Antoilite Louis Jeune was born on May 15,1948 to the late Eliaze Angrand and Delieus Soirilus in Ansagelet, Lagonave, Haiti. She completed her education in Haiti, and on February 18,1998 she relocated to the U.S. in search of a better life. Antoilite was a loving and caring woman. A woman of faith who never missed a service in the last twenty years, she has been a faithful member of the Church of God by Faith. There she served as an usher each Sunday. She was an employee of Marriott in the laundry department for 10 years where she was loved by all her co-workers. She was a giver, she would give her last with a smile on her face. The memories she left us will last forever. The tenderness she has shown us will never fade. The genuine love Antoilite has given us can only be strengthened by the gift of time, for where roots grow deep memories grow forever. 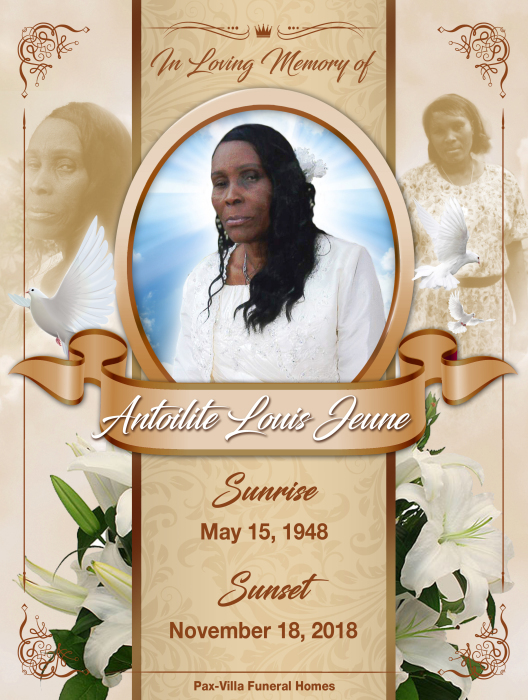 On Sunday, November 18, 2018, Mrs. Antoilite Louis-Jeune was called Home to be with the Lord. Her children from 33 years of marriage to Joseph Louis-Jeune: Bethel Louis Jeune, Cassandre Louis-Jeune & James Louis Jeune.